Delacroix, 'Selfportrait', c. 1837; - quote of Delacroix, 1859: 'They say that truth is naked. I cannot admit this for any but abstract truths; in the arts, all truths are produced by methods which show the hand of the artist' . Eugène Delacroix (April 26 1798 – August 13 1863) was a French painter, one of the leading artists of Romanticism in Europe of the nineteenth century. In the midst of the activities that distract me [shooting partridges in the woods], when I remember a few lines of poetry, when I recall some sublime painting, my spirit is roused to indignation and spurns the vain sustenance of the common herd. And in the same way, when I think of those I love, my soul clings eagerly to the elusive trace of these cherished ideas. Yes, I am sure of it, great friendship is like great genius, and the remembrance of a great and enduring friendship is like that of great works of genius... What a life would be that of two great poets who loved each other as we do! That would be too great for human kind. I am thinking of painting for the coming Salon a picture [probably the large and unfinished painting 'Botzaris' by Delacroix] whose subject I shall take from the recent wars between the Turks and the Greeks. I think that.. .. this would be a way to attract some attention. I should therefore like you to send me some drawings of the country round Naples, a few quick sketches of seascapes or picturesque mountain sites... Why not also send a few of the studies you have in your portfolio? You don’t need them while you are out there, and it would oblige you to make some more of them. I must try to live austerely, as Plato did.. .I need to live a more solitary life.. .Valuable ideas beyond number miscarry because I have no continuity in my thoughts.. ..The things which we experience for ourselves when we are on our own are stronger by far, and fresher... [his painting 'The Massacre at Chios' was half done when he wrote this note]. I have seen here [in London] a play on Faust, the most diabolic thing imaginable. The Mephistopheles is a masterpiece of caricature and intelligence. 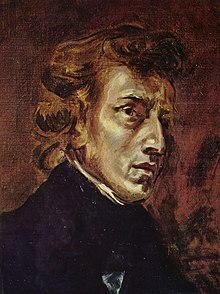 It is Goethe's 'Faust', but adapted; the principle features are preserved. They have made it into an opera mixed with comedy and with everything that is most sombre. The scene in the church is given with the priest's chanting and the organ in the distance. Impossible to carry an effect further, in the theater. I am not doing very much as yet. I am put out by this manner of the Salon. They will end by persuading me that I have produced a veritable fiasco. But I am not yet entirely convinced of it. 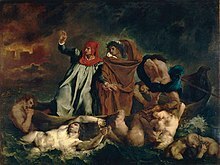 Some say it is a complete downfall; that the 'Death of Sardanaplus' [Delacroix painted this painting in 1827 after the drama, written by Byron] is that of the Romantics, inasmuch as Romantics do exist; others merely say that I am an 'inganno' [a fraud].. ..So I say they are all imbeciles, that the picture has its qualities and its defects, and that while there are some things I could wish to be better, there are not a few others that I think myself fortunate to have created, and which I wish them. Well! A general invasion: Hamlet rears his hideous head, Othello is preparing his dagger, that essentially murderous weapon, subversive of all good theatrical government. What more, who knows.. .King Lear is to tear his eyes before a French audience. It should be a point of dignity for the Academy to declare that all imports of this kind are incompatible with public morals. Farewell good taste! In any case, equip yourself with a stout coat of mail under your evening dress. Beware of the Classicist's daggers, or rather, sacrifice yourself valiantly for our barbarian pleasure.. The contour should come last, only a very experienced eye can place it rightly. Of late, men seem to have been possessed by an incomprehensible impulse to strip themselves of everything with which nature has endowed them in order to make them superior to the beasts of burden. A philosopher is a gentleman who sits down four times a day to the best meals he can possibly obtain, and who considers that virtue, glory and noble sentiments should be indulged in only when they do not interfere with those four indispensable functions and all the rest of his little personal comforts. At this rate, a mule is a better philosopher by far, because in addition to all this he puts up with blows and hardship without complaint. ..that famous idea of 'beauty', which is, as everybody says, the goal of the arts. If it is their only goal, what becomes of the men like Rubens, Rembrandt, and all the northern natures generally, who prefer other qualities? Demand purity, In a word beauty.. .In general the men of the north tend less in that direction. The Italian prefers ornament. I see in painters prose writers and poets. Rhyme, measure, and the turning of verses, which is indispensable and which gives them so much vigor, are analogous to the hidden symmetry, to the equilibrium at once wise and inspired, which governs the meeting or separation of lines and spaces, the echoes of color, etc... ..but the beauty of verse does not consist of exactitude in obeying rules.. .It resides in a thousand secret harmonies and conventions which make up the power of poetry and which go straight to the imagination; in just the same way the happy choice of forms and the right understanding of their relationship act on the imagination in the art of painting. Criticism, like so many other things, keeps to what has been said before and does not get out of the rut. This business of the 'Beautiful' some see it in curved lines, some in straight lines, but all persist in seeing it as a matter of line. I am now looking out of my window and I can see the most lovely countryside; lines just do not come into my head: the lark is singing, the river sparkles with a thousand diamonds, the leaves are whispering; where, I should like to know, are the lines that produce delicious impressions like these? They refuse to see proportion or harmony except between two lines: all else they regard as chaos, and the dividers alone are judge. If you make the light dominate too much, the breadth of the planes leads to the absence of half tints, and consequently to discoloration; the opposite abuse is harmful above all in big compositions destined to be seen from a distance, like ceilings, etc. In the latter form of painting, Paul Veronese goes beyond Rubens through the simplicity of his local color and his breadth in handling the light.. .Veronese had greatly to strengthen his local color in order that it should not appear discolored when immunized by the very broad light he threw on it. Perhaps we shall one day find that Rembrandt is a greater painter than Raphael. I write down this blasphemy which will cause the hair of the school-men to stand on end without taking sides. One should always be desiring or hoping for something. When one can hope for that which one desires, one enjoys the greatest happiness of which our thinking apparatus is capable. To obtain what one has been desiring is the first step to the depths of sadness and even pain, from which one can never emerge. The sea still enchants me; I linger for three or four hours at a time on the jetty or at the edge of the cliffs. Impossible to tear oneself away. If I could lead such a life for a certain time, coupling it with some interesting occupation, I should enjoy excellent health. How do things stand, now, if the subject contains a large element of pathos?.. .Consider such an interesting subject as the scene taking place around the bed of a dying woman, for example; seize and render that ensemble by photography, if that is possible [photography was a very recent invention in Paris ca. 1853, a.o. by the photographer Nadar ]: it will be falsified in a thousand ways. The reason is that, according to the degree of your imagination, the subject will appear to you more or less beautiful, you will be more or less the poet in that scene in which you are an actor; you see only what is interesting, whereas the instrument puts in everything. He [ Michelangelo ] did not know a single one of the feelings of man, not one of his passions. When he was making an arm or a leg, it seems as if he were thinking only of that arm or leg and was not giving the slightest consideration to the way it relates with the action of the figure to which it belongs, much less to the action of the picture as a whole.. .Therein lies his great merit; he brings a sense of the grand and the terrible into even an isolated limb. After leaving [the International Exposition in Paris, with a lot of new machines], I went to see Courbet's exhibition; he has reduced the admission to ten cents. I stay there alone for nearly an hour and discover that the picture [ 'L'atélier' / the Painter's Studio - 1855] of his which they refused [for exposing on the official Salon in Paris ] is a masterpiece; I simply could not tear myself away from the sight of it. Constable, an admirable man, is one of England's glories. I have already told you about him and about the impression he had made on me when I was making 'The massacre at Chios'. He and Turner were real reformers. They broke out of the rut of traditional landscape painting. Our School [ French Romanticism ], which today abounds in men of talent in this field, profited greatly by their example. Géricault [first leader of French Romanticism, followed by Delacroix after his early death] came back in a daze from seeing one of the great landscapes Constable sent us. I did not come to know part II of 'Faust' until long after I made my illustrations, and even then only very superficially. It struck me as an ill-digested work, of little interest from the literary standpoint, but among those most calculated to inspire a painter owing to the mixture of characters and styles it contains.. .You asked what gave me the first idea of the Faust lithographs. I remember that about 1821 I saw the designs made by Retch [ Retzsch] and found them rather striking; but it was above all the performance of a dramatic opera on Faust that I saw in London in 1825 which stirred me to do something on the subject. The actor.. ..was a perfect Mephistopheles; he was fat, but that in no way diminished his nimbleness and his Satanic character. Rubens, when past fifty years of age, used the time he did not give to the business of his mission to the King of Spain in copying the superb Italian originals he found in Madrid.. .Accuracy of the eye, sureness of the hand, the art of carrying the picture on from the indications of the lay-in to the rounding out of the work, and so many other matters which are all of primary importance, demand application at every moment, and the practice of a lifetime. The Natural History Museum is open to the public on Tuesdays and Fridays. Elephant, rhinoceros, hippopotamus; extraordinary animals! Rubens rendered them marvellously. I had a feeling of happiness as soon as I entered the place and the further I went the stronger it grew. I felt my whole being rise above commonplaces and trivialities and the petty worries of my daily life. I believe it safe to say that all progress must lead, not to further progress, but finally to the negation of progress, a return to the point of departure. Proportion applies to sculpture as to painting; perspective determines the contour; chiaroscuro gives relief through the disposition of lights and shadows in their relationship with the background; color gives the appearance of life.. .The colorists, the men who unite all the phases of painting, have to establish, at once and from the beginning, everything that is proper and essential to their art. They have to mass things in with color, even as the sculptor does with clay, marble or stone; their sketch, like that of the sculptor, must also render proportion, perspective effect, and color. Commonplace people have an answer for everything and nothing ever surprises them. They try to look as though they knew what you were about to say better than you did yourself, and when it is their turn to speak, they repeat with great assurance something that they have heard other people say, as though it were their own invention. Can any man say with certainty that he was happy at a particular moment of time which he remembers as being delightful? Remembering it certainly makes him happy, because he realizes how happy he could have been, but at the actual moment when the alleged happiness was occurring, did he really feel happy? He was like a man owning a piece of ground in which, unknown to himself, a treasure lay buried. The more I think about colour, the more convinced I become that this reflected half-tint is the principle that must predominate, because it is this that gives the true tone, the tone that constitutes the value, the thing that matters in giving life and character to the object. Light, to which the schools teach us to attach equal importance and which they place on the canvas at the same time as the half-tint and shadow, is really only an accident. Without grasping this principle, one cannot understand true colour, I mean the colour that gives the feeling of thickness and depth and of that essential difference that distinguishes one object from another. We are told that Shakespeare's plays were generally performed in barns and that no great trouble was taken over the production. The constant changes of scene which, incidentally, seem the sign of a decadent art rather than one which is progressing, were shown by placards with the inscription: "A Forest," "A Prison," and so on. Within this conventional setting the onlooker's imagination was free to follow the actions of the various characters who were animated by passions drawn from nature, and that was enough for him. So-called innovations are gratefully seized on as an excuse for poverty of invention and in the same way, the long descriptive passages that so overburden modern novels are a sign of sterility, for it is obviously easier to describe a dress or the outward appearance of an object than to trace the subtle development of a character or portray the emotions of the heart. He Titian is the least mannered and consequently the most varied of artists. Mannered talents have but one bias, one usage only. They are more apt to follow the impulse of the hand than to control it. Those that are less mannered must be more varied, for they continually respond to genuine emotion. For his contemporaries, Racine was a romantic, but for every age he is classical, that is to say, he is faultless. Painting, in the beginning, was a trade like any other. Some men became picture-makers as others became glaziers or carpenters. Painters painted shields, saddles and banners. The primitive painter was more of a craftsman than we are; he learned his trade superlatively well before he thought of letting himself go. The reverse is true today. Curiously enough, the Sublime is generally achieved through want of proportion. Nature creates unity even in the parts of a whole. The so-called conscientiousness of the great majority of painters is nothing but perfection laboriously applied to the art of being boring. Les artistes qui cherchent la perfection en tout sont ceux qui ne peuvent l'atteindre en aucune partie. Nature is just a dictionary, you hunt in it for words.. ..you find in it the elements which make a phrase or a story; but nobody would regard a dictionary as a composition in the poetic sense of the term. Besides, nature is far from being always interesting from the point of view of the effect of the whole.. .If each detail is perfect in some way, the union of these details seldom gives an effect equivalent to that which arises, in the work of a great artist, from the total composition. Like a smothered, love-lost sigh, an air of Weber. ..but there is a master canvas in the Palais The Luxembourg: 'The Bargue of Dante'. If we want to visit Delacroix, our pretext might be to ask him permission to do a copy of the Bargue.. [after having visited Delacroix who received them graciously, but emphasized them repeatedly the importance of studying Rubens, Manet said to his friend A. Proust:] ..Delacroix isn't cold at all, but his doctrine is frozen. Anyway, we'll copy the Bargue. It's a fine piece. Delacroix was passionately in love with passion, and coldly determined to seek the means of expressing passion in the most visible manner. In this dual character, be it said in passing, we find the two distinguishing marks of the most substantial geniuses, extreme geniuses. Variant translation: Delacroix was passionately in love with passion, but coldly determined to express passion as clearly as possible. Eugène Delacroix was a curious mixture of skepticism, politeness, dandyism, willpower, cleverness, despotism, and finally, a kind of special goodness and tenderness that always accompanies genius. ...and, to tell the truth, I find it very difficult to like new art. It is only lately, and after having been unsympathetic for a great while, that I at last understood Eugene Delacroix, whom I now think a great man. Color, which is controlled by fixed laws, can be taught like music. . . . It is because he knew these laws, and studied them profoundly, after having intuitively divined them, that Eugene Delacroix became one of the greatest colorists of modern times. 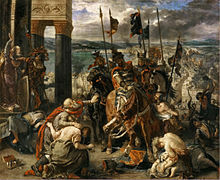 Ferdinand-Victor-Eugène Delacroix, a painter of noble lineage, who carried a sun in his head and storms in his heart; who for forty years played upon the keyboard of human passions, and whose brush— grandiose, terrifying or tender— passed from saints to warriors, from warriors to lovers, from lovers to tigers, and from tigers to flowers. I can't tell you how much I enjoyed reading this article and some other things about Delacroix..
See for this anecdote, taken from Charles Blanc, in Les artistes de mon temps', letter 496, n. 7. ..what Delacroix occupies himself about, what moves him, is the drama. The subject is no great thing for this grand artist; it is naught but a pretext; the dramatic impression proceeding from it is everything. When Delacroix paints the magnificent upon the Cross'.. ..it is the supreme drama which inspires him; what he desires to render is the grand crime of the crucifixion, and not the Crucified Himself. ..The so-called classical school, men of a rare perfection in their science, understood nothing of this art - an art bursting from the painter's heart, with a passion which sometimes made it rise to the most impregnable altitudes, yet which sometimes, by its very exaggeration, brought it down again to the ground. For the works of Delacroix have their weak passages, I admit, because they are human works, because they are not born of cold calculations of the mind, and because the vexations of the painter, in following his ideal, pierce through them. His [Delacroix's] remains the finest palette in France and nobody in our country has possessed at once such calm and pathos, such shimmering color. We all paint in him. another & longer version: Maybe Delacroix stands for Romanticism. He stuffed himself with too much Shakespeare and Dante, thumbed through too much Faust. His palette is still the most beautiful in France, and I tell you no one under the sky had more charm and pathos combined than he, or more vibration of colour. We all paint in his language, as you all write in Hugo's. He [Delacroix] turns David upside down. His painting is iridescent. Seeing one Constable [famous English landscape painter, admired by French painters, then] is enough to make him understand all the possibilities of landscape, and he too sets up his easel by the sea.. .And he has a sense of human being, of life in movement, of warmth. Everything moves, every glistens. The light!.. .There is more warm light in this interior [probably: 'Woman of Algiers'] of his than in all of Corot's landscapes.. The light! [in the paintings of Délacroix].. ..There is more warm light in this interior [probably in the painting 'Woman of Algiers'] of his than in all of Corot's landscapes..
Delacroix felt his composition more vividly as a whole, thought of his figures and crowds as types, and dominated them by the symbolic figure of Republican Liberty which is one of his finest plastic inventions..